UNITED NATIONS, Aug 3 2012 (IPS) - At the Yeosu World Expo 2012, the U.N. commemorated the thirtieth anniversary of the U.N. Convention of the Law of the Sea (UNCLOS), highlighting efforts to quell the global scourge of piracy. With its theme of the “Living Oceans and Coast”, Expo 2012 has turned the attention of a global audience to marine issues ranging from declining fish stocks and pollution to illegal fishing and piracy. “Piracy has existed for thousands of years. It had substantially diminished in the end of the nineteenth century and seemed to have become one of the legends of the past, gradually disappearing from criminal law legislation,” Patricia O’Brien, U.N. under secretary-general for legal affairs, said at the Expo 2012 U.N. Pavilion. “A few decades ago, the ‘pirate phoenix’ appeared to be rising again to become a regional, if not a global scourge,” she told the audience prior to a film screening on the law of the seas. 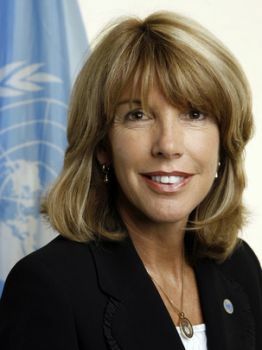 In an interview with U.N. correspondent Isabelle de Grave, Patricia O’Brien talks about current efforts under UNCLOS and beyond to combat piracy in the Malacca Strait, which runs between the Malay Peninsula and the Indonesian island of Sumatra. Q: How serious is the threat of piracy to Asia? A: The threat of piracy and armed robbery on board ships is of utmost importance to the U.N. and we are constantly monitoring the situation. Piracy poses a serious threat to the economies of all nations, as 80 percent of the volume of global trade is seaborne, representing 70 percent of its value, and it is expected to increase by 36 percent by 2020. The Strait of Malacca is particularly prone to pirate attacks as one of the most important and strategic passages for maritime trade between Europe and East Asia. It supports 50 percent of the world’s oil shipments, including 80 percent of petroleum imports to Japan and the Republic of Korea among others. Furthermore, at the regional and local levels, piracy poses a serious threat to the safety and security of seafarers and fishermen, whose means of livelihood directly depend on their ability to access specific maritime spaces and routes. Southeast Asian waters, and the many island and archipelagic states therein, are no exception. The safety of maritime circulation also bears heavily on the ability of some of these states to maintain political stability. Q: Many fisherman impoverished by declining fish stocks turn to piracy. Will the Yeosu Project, which aims to build the capacity of emerging countries to address such issues, contribute to combating piracy? A: The initiative taken by the Republic of Korea is commendable, and constitutes an important part of the regional and international efforts that must be undertaken by States Parties to UNCLOS and to the 1995 Agreement relating to the Conservation and Management of Straddling Fish Stocks and Highly Migratory Fish Stocks to promote the conservation of fish stocks, both within and beyond the Exclusive Economic Zone (EEZ, a nation’s official territorial waters). However, the root causes of piracy do not only lie in the mismanagement of fish stocks and the depletion of resources from seas and oceans. If the trends regarding piracy off the coast of Somalia are to provide any guidance, whereby pirates have expanded their areas of operation and acquired heavier artillery, allowing them to attack larger ships further out at sea, major shipping routes such as the Strait of Malacca should continue to be monitored closely. Although reported incidents of piracy in the Straits of Malacca and Singapore saw a 50 percent decrease between the first half of 2011 and the first half of 2012, coastal states as well as ship owners should not become complacent. Coastal States have a responsibility to adopt and implement best management practices when operating in areas with a high level of activities. They also have to educate transiting merchant ships on their local fishing practices and procedures in order to reduce instances of transgression of fishing gear, as well as incidents where merchant ships mistake fishing vessels for pirates. Incidents of piracy will only consistently decrease if these issues are tackled simultaneously. In this globalised economy, where a state’s economy may still be impacted by acts of piracy committed thousands of miles away, improving the socioeconomic situation of fishermen locally is no longer sufficient. Q: How effective are UNCLOS and other regional and international initiatives in the fight against piracy? A: The definition of the crime of piracy is contained in UNCLOS under one of the most significant sections of the Convention, (article 101 Part VII) that regulates the High Seas. States have an obligation to cooperate to the fullest possible extent in the repression of piracy and have universal jurisdiction on the high seas to seize pirate ships and aircrafts and arrest the persons and seize the property on board. UNCLOS provisions have been subject to national implementation by many states, which have issued legislation to criminalise piracy, allowing their domestic courts to prosecute persons suspected of this crime. For instance, concerning piracy off the coast of Somalia, over 1,100 persons have either been arrested or tried and found guilty on the basis of such legislation. And efforts are continuing, at the international and regional levels, to assist states in building the capacity to conduct effective prosecutions and enforce the sentences imposed, which will have a deterrent effect on communities where the culture of piracy is still rampant. The Strait of Malacca benefits from a patrolling system akin to that established with the convoy participation process off the coast of Somalia that the Republic of Korea just joined. The Malacca Straits Patrols (MSP) is comprised of the Malacca Straits Sea Patrol (MSSP), the “Eyes-in-the-Sky” (EiS) air patrols, and the Intelligence Exchange Group (IEG), which are a set of practical cooperative security measures undertaken by the four littoral States, namely Indonesia, Malaysia, Singapore, and Thailand, to ensure the security of the Strait of Malacca. This arrangement entails conducting coordinated naval and air patrols while facilitating the sharing of information between ships and the Monitoring Action Agency. This is a very sophisticated system, which has allowed the number of piracy attacks in the Malacca Strait to drop from 38 reported incidents in 2004 to none in 2011, as per the International Maritime Bureau data.